The Queensland Ambulance Service (QAS) provides emergency medical assistance, treatment and transport through a network of 260 ambulance stations across the state. The Queensland Fire and Emergency Service is the primary provider of fire and emergency services in Queensland. 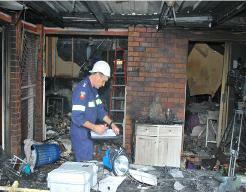 The Queensland Fire and Emergency Services has over 60 trained fire investigators responsible for determining the cause and origin of both accidental and deliberately lit fires. The Queensland Police Service (QPS) is the primary law-enforcement agency for the state. QPS also provide community education and support programs. Surf Life Saving Queensland (SLSQ) is the state’s beach safety and rescue authority and a member of the volunteer marine rescue service. Volunteer Marine Rescue Association Queensland (VMRAQ) provides marine search and rescue, recreational trip planning and guidance on disaster and emergency planning for mariners.